Once again the day dawned bright and clear at French Creek and WOW launched cheerful participants into the field for a day of shooting, placing decoys, and handling retrievers. But beginning their day, Biologist Don Kraege of the Washington Fish and Wildlife Department, presented a power point discussion of local duck species and their unique behavior and habitats; correct hunting etiquette and requirements; and Washington’s Waterfowling regulations. 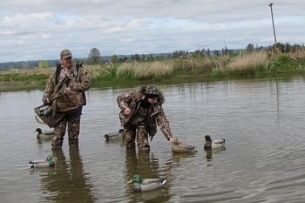 The day’s group of future Waterfowlers ranged from complete novices to accomplished shooters. After a safety discussion and an example of shot patterning, women enthusiastically broke clays and amazed themselves with their capabilities. Moving targets are a challenge and most made contact and learned why their stance, awareness and timing made a difference. Patient instructors and many opportunities to shoot produced some special memories? Next, visiting a working blind used on the property, talking about protocol inside the blind and setting decoys yielded further understanding of the hunter-waterfowl connection. Moving on to Retrievers, women had the chance to see working dogs in action and then try their hand at over water guidance in the field. A Labrador, a Golden Retriever and an Irish Waterdog were the working dogs of the day and participants saw the value of partnership in the skill of waterfowling. 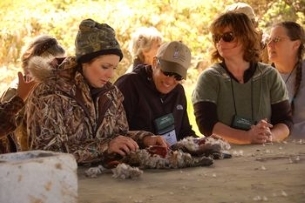 The final station was After the Catch which invited participants to clean a duck and discuss several ways hunters prepare waterfowl for the table. The day concluded with three presentations: The first by Veterinarian Dr. Casey Kime included tips for a First Aid bucket in your car; emergency moves for treating dogs in the field or after accidents, and many sensible tips for safety and nutrition. Secondly, Don Kraege went over a ‘friendly’ test of information gleaned from the day and some surprise items from Cabelas went to happy participants! And finally, everyone gathered to taste the joys of the hunt – roast duck, duck kabobs, and summer sausage! It was a fitting end to a wonderful and successful day at French Creek, whose generous hospitality made it all possible. Many thanks to the instructors and team who helped create the success!